Local Edinburgh school children have been given a front row seat to the unveiling of a space rocket which has got everyone talking across Midlothian. The Black Arrow, the UK’s first and only rocket to successfully place a satellite into orbit, was unveiled at Bishop’s Move Edinburgh’s Penicuik storage facility after a 10,000-mile journey home. The winners of an art competition, run by the removals company Scottish space company Skyrora Ltd and assisted by Midlothian Council, were given the best view in the house. The Black Arrow, which was brought home by Skyrora was developed during the 1960s, and for four launches between 1969 and 1971. Its final flight was the first and only successful orbital launch to be conducted by the UK and placed the Prospero satellite into low earth orbit. The three-stage rocket was 13m’s (43ft) in length and 2m’s (6ft 7) in diameter. 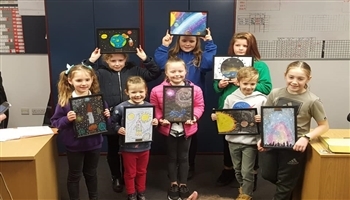 Pupils at schools across the Penicuik region were challenged to enter the art competition by providing their drawings of space which featured space rockets, planets, stars, and aliens. The winners and runner ups from all the great entries were chosen by Kenny Janczyk, Bishop’s Move Edinburgh Branch Manager and Becky Morris, Business Development Executive at Skyrora. The awards were presented by Vice Marshall Rochelle (MOD) who provided a speech on inspiring future generations. Amongst the other attendees at the unveiling at Bishop’s Move Edinburgh included Professor Stephen Salter, who worked on the Black Knight – the predecessor of the Black Arrow; Mike Taylor, Markets & International Programme Director at the UK Space Agency; and Ivan McKee, from the Department of Trade, Investment & Innovation.